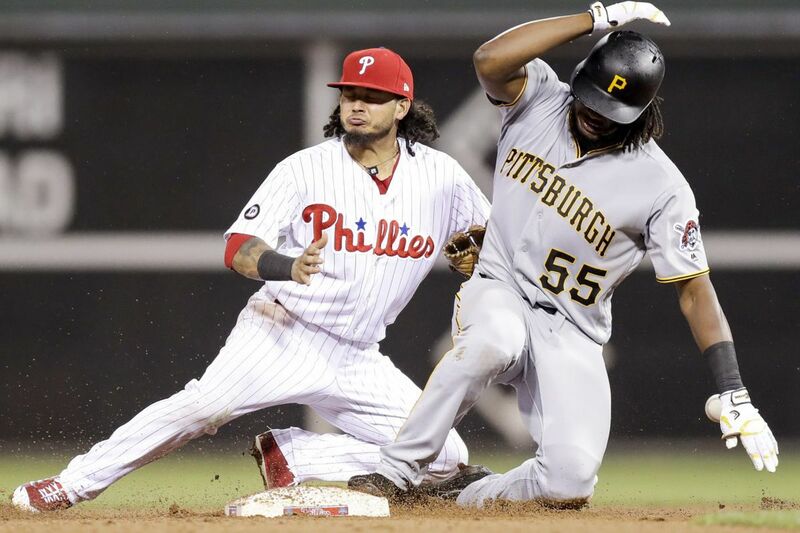 The Pirates’ Josh Bell slides into second after hitting an eighth-inning RBI double as Freddy Galvis covers. The final three weeks of July will be busy for the Phillies as they try to ship their veterans off to contenders before the July 31 trade deadline. Some will be easier to move than others, and Thursday's 6-3 loss to Pittsburgh offered a glimpse as to the reasons why. Jeremy Hellickson and Pat Neshek displayed their trade value while Joaquin Benoit — who allowed the decisive run in the eighth — may have hurt his. The veterans are the obvious candidates to be shipped, but no player, team president Andy MacPhail said last week, is untouchable. Benoit was booed as he walked off the mound after allowing three runs in the eighth inning. The righthander gave up an RBI double to Josh Bell, an RBI single to Gregory Polanco, and an RBI double to Elias Diaz. Benoit was yanked before he could record the third out. The meltdown came minutes after the Phillies rallied to tie the score in the bottom of the seventh. It was just another loss in a season full of them. It may not be as easy to find a partner for Benoit as it will be for Neshek and Hellickson. The righthander turns 40 before the trade deadline and is striking out batters at the lowest rate of his career. He has a 6.17 ERA in his last 13 appearances. The Phillies will have to hope that a team relies more on Benoit's track record than his current performance. Benoit has been a steady reliever for most of his 30s and was dominant in last season's second half after being acquired by the Blue Jays. Hellickson allowed three runs in six innings in his final start of the first half. The righthander will likely make three more starts before the July 31 trade deadline and it is all but certain that Hellickson will be moved. Hellickson has a 3.16 ERA in his last four starts. "Inconsistent is probably the best word for it," Hellickson said when asked to describe his first half. "It was nice to finish halfway decent. It would have been nice to keep the ball in the yard the last couple of games and it would have made the last couple a little better. Good thing is that I feel great and the stuff is feeling good." He will not yield a king's ransom, but the Phillies will sweeten the return by offering to pay down the majority of his remaining $17 million contract. Hellickson is not an ace, but he is a solid arm for the middle of a rotation. He has reached the sixth inning in 10 straight starts. "He's a good pitcher," manager Pete Mackanin said. "He's had his ups and downs this year, but in general the positives outweigh the minuses. He's going to throw you strikes and on a given day, he's really tough to hit. Today, he got hurt by the long ball but still gave us six innings." Hellickson was relieved by Neshek, who opened a pair of new cleats before the game that he will wear on Tuesday as the Phillies' lone all-star. He has been terrific in the first half and pitched a scoreless seventh. Neshek has allowed runs in just two of his 35 games this season. The reliever will make an easy trade. Hellickson's outing could have been aided had the Phillies not made their last two outs of the second inning at second base. Aaron Altherr was thrown out after trying to stretch his hit off the left field wall into a double. Odubel Herrera was thrown out moments later after his bloop single fell into left field and he tried to hustle into second. The poor base running thwarted a rally and may have denied the Phillies a needed run. "I encourage the guys to be aggressive and turn a single into a double, however when you take that hard turn toward second base, you should have time to decide," Mackanin said. "I think if those guys had to do it over again, they would've stopped and went back to first base." "He made a good play off the wall and made a perfect throw," Altherr said. "Not too much I can do about that. Just have to read it a little better and stay at first next time. He made two good plays on me." Their first run — and lone run until the seventh — scored when Andrew Knapp raced home from first on a throwing error by Pirates catcher Elias Diaz. Andres Blanco struck out and Diaz tried to throw behind Blanco and catch Knapp at first base. But Blanco's bat flew into the stands and struck an empty seat as he struck out. Pirates first baseman Josh Bell was distracted by the bat and Diaz' throw sailed into right field. Knapp scored with ease. Blanco's loose grip was the ultimate distraction. The Phillies tied the score at 3 in the seventh with a two-run single by Altherr, who was again thrown out at second base. It was the third out the Phillies made at second and all three assists came from Pittsburgh left fielder Jose Osuna. The game was tied, but Benoit would soon be on his way out of the bullpen. The Phils' chances — and Benoit's trade value — were set to take a hit.